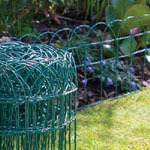 These pre formed garden hanging basket liners are pre-moulded for ease of use. Just drop into your hanging basket. 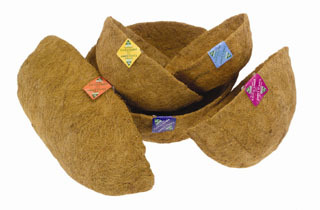 This basket liner is made from co-co fibres with latex coating, long lasting and natural look. Also available trough liners, hay rack liners, wall trough liners and cradle basket liners. These pre-formed wall manger liners are pre-shaped for convenience (just drop in). 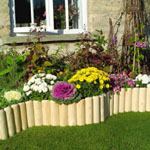 This basket liner is long lasting natural co-co fibres with latex coating. Also available wall basket liners, trough basket liners, hay rack basket liners, hanging basket liners, wall trough basket liners and cradle basket liners. These pre-formed wall trough liners are pre-shaped for convenience (just drop in). These pre-formed blacksmith wall trough liners are pre-shaped for convenience (just drop in). 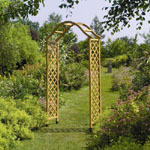 Size - 48" (120cm) wide x 24cm (9") high x 24cm (9") deep. Click on image to see full range of iron hanging baskets. Click on image to see full range of flower basket liners.